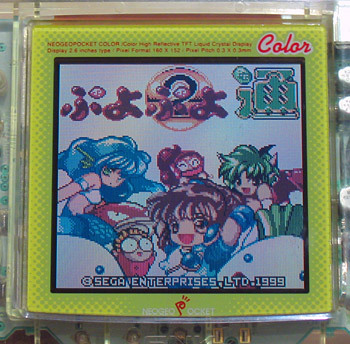 I can guarantee you that almost nobody else in the world has this color variant of the NGPC. That’s simply because it’s so nasty; it’s probably the only true piss-colored game machine anywhere. I’m amazed that SNK ever offered such a color variant, and they only did so in Japan. But this is actually one reason why I wanted it – I knew nobody else would have a system that looked like this, and I like systems that are so ugly, you can’t help but look at them. 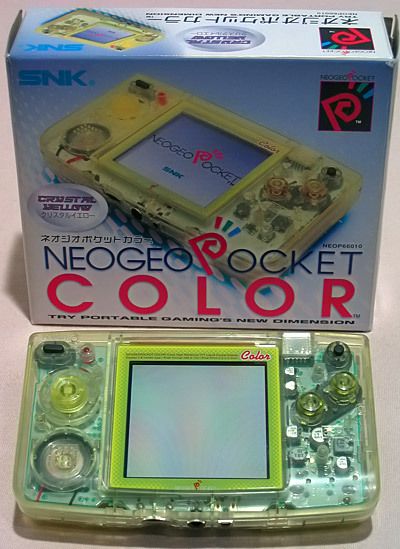 This is one of the later revisions of the NGPC, which were all only ever offered in Japan, even while the older model continued to sell in the United States. The major differences were the size and colors offered – the second generation NGPC’s were slightly smaller and were produced in a variety of solid and clear colors – the clear blue model looks particularly nice. Clear (or “crystal” as SNK called them) models were never sold in the United States, except for plain (uncolored). I actually love this system. It’s fantastic; it’s everything you could want a handheld to be, at least at the time it was available. Its only competition at that time was the Game Boy Color, and it totally destroys that system in every way. It’s got better graphics (it’s got a 16 bit CPU vs. the GBC’s 8 bit), it’s got the best controller ever put into a handheld, it’s got nice, snappy buttons, it’s very small and it’s very comfortable to hold. The screen is extremely sharp, and SNK took a cue from Nintendo in not including a backlight in order to save battery life. As a result, battery life blows the doors off the GBC – 40 hours! This was the most serious competition Nintendo had ever faced in handheld gaming to that point – this is the one system that has ever seriously bested the Game Boy at its own game, literally. Unlike previous failed systems like the Game Gear and Lynx, the NGPC was designed with the same philosophy as the Game Boy, and it beats it in all areas. Unfortunately, SNK just did not have the resources to pour into the marketing and development of this system, and it disappeared from the market after about three years. SNK itself would go under soon after, though they’ve now been resurrected under the guise of SNK Playmore.